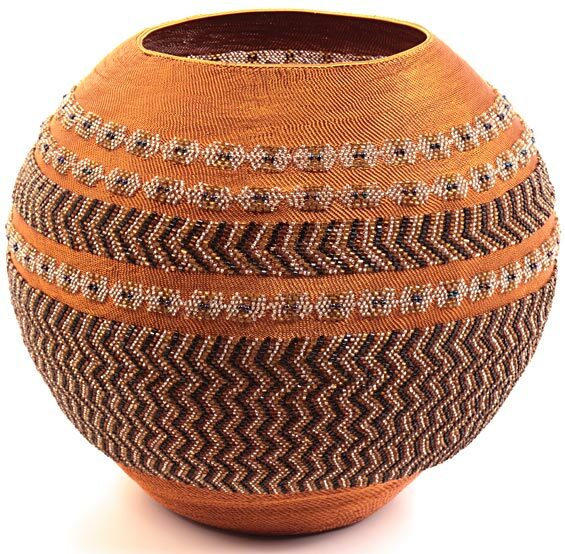 These pot shaped baskets are created only by masterweavers. First they make a traditional piece of pottery and then begin weaving over it. Each glass bead is individually threaded onto the copper wire and woven into the basket with very fine weaving. When the basket is complete, the pottery is intentionally cracked and removed from the inside. A small basket can take a month to complete while a large basket can take many months and even small differences in size can make weeks difference in weaving time.